Showing results for "wilton tips"
Product Description: Everything needed to begin bag and tip decorating at a beginner level but with additional techniques, inspiration and time-saving tools. The set incudes: Round Tip 3, Round Tip 6, Round Tip 12, Round Tip 2A, Star Tip 16, Star Tip 21, Star Tip 1M, Petal Tip 104, Petal Tip 127, Leaf Tip 352, Leaf Tip 366, Specialty Tip 233, Basketweave Tip 48, Ruffle Tip 86, Drop Flower Tip 129, Star Tip 48, Drop Flower Tip 2D, Star Tip 32, 24 disposable bags, Twist Quick coupler, Bag Cutter, 23cm tapered spatula, durable storage case and instructions. Product Description: Create beautiful decorations -shells, stars, rosettes, leaves. 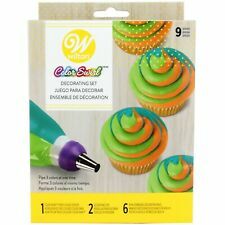 The great recipe book included is filled with fabulous ideas to serve your family and friends: Decorate desserts with elegant whipped cream or icing designs. Dress up pastry shells with dramatic swirls of mousse. Add sophistication to savouries with pretty piped cream cheese or seafood spread decorations. 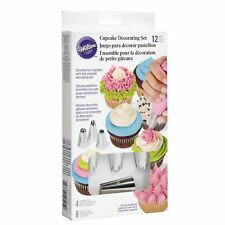 With Dessert Decorator ProTM, you can do it all! Includes 6 Durable Nickel-Plated Tips, 2 Tip Couplers (two sizes hold standard (small) and large tips), Tip/Coupler Dishwasher and Storage Bag.